Okay, you guessed it…there’s no meat in this one. But it is fun and nicely textured just the same! I have tried lots of vegetarian meatloaf recipes over the past few months, and none of them could manage to tickle my fancy as far as texture. They were all crumbly or flaky in their end result, and when they did act like a loaf, they certainly did not taste like anything that resembles meat. So, after some disastrous experimentation, I have come up with something passable. This is not exactly the right texture, but it is closer than most. Somehow, I seem to have become the faux-foods lady, developing lots of recipes to replace people’s meaty favorites and old time instant foods with something more acceptable to their new healthy and vegetarian ideals. 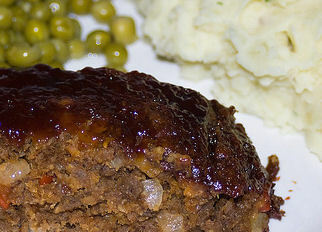 The gravy is deliciously beefy, but the “meat”loaf is transitional. I remain completely open to suggestions on this one and do not consider it to be a 100% completed recipe. So, try it out and let me know what you think. 1. Dissolve yeast and malt extract in the warm water and add TVP. Let soak for 20 minutes. 2. Wring the liquid out of the TVP, one handful at a time and place in a mixing bowl. 3. Add the breadcrumbs, eggs, flour and all other ingredients. 4. Mix thoroughly and press into greased loaf pans. 5. Cover with a 1/2 inch of gravy and bake at 200°C or 400°F for 30-40 minutes. 6. Cut and serve with mashed potatoes or salad. 1. Place 2 cups of water in a suacepan over medium-high heat. 2. Dissolve yeast and malt extracts into the water. 3. Add the chopped mushrooms, salt pepper and chives. 4. When water is warm, but NOT yet boiling add and whisk the corn starch. 5. Boil and allow to thicken, adding more corn starch as needed. 6. Ladle over “meat”loaf before baking and over mashed potatoes before serving. This is working on becoming one of my favorite recipe combos! But, again, after trying these, please add any suggestions that you may have to the comments. Wow! Your meatloaf looks awesome. Very traditional and yummy :). Great job! Looks like I have some shopping to do tomorrow. This looks great! I too have been looking for a good “meatloaf” recipe and this does indeed look divine, but where does one buy barley and yeast extracts?